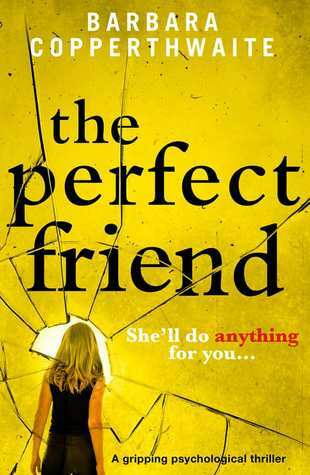 The Perfect Friend by Barbara Copperthwaite is a psychological thriller that follows two friends, Alex and Carrie. Having read a couple of other novels from the author I knew I wanted to read this one but a big plus for having a character with my namesake in the book because I really have a tendency to grab those! The ladies, Alex and Carrie, met while at a support group and were drawn to one another. Alex’s husband has left her and her two children, twins, will not even speak to her and has developed anorexia from all of the stress. Carrie has been battling cancer for a while and this time it has caught up with her and the end is getting near. One would ask how in the world could a story about two best friends that need each other for support could fall into the psychological thriller category? But this being a novel from Barbara Copperthwaite I knew there was going to be some twists and turns coming. I’ve gotten to the point that going in to one of her novels that I just don’t trust her characters but I do enjoy the ride waiting to find out what they’ll have in store for me. Again this would be another that you have to dive in and uncover all of those secrets and when you think you are done just think again. Great review. I have this book yet to read. Ooh I just barely started this but didn’t get far yet! I’m glad to hear it gets twisty because so far it doesn’t seem like a thriller! Haha I didn’t want to do too much of a summery there so that’s where my makes you wonder why this would be a thriller came from, you do start out with OK, so they’re friends… ?? Exactly!!! Looking forward to seeing what’s ahead for these two! Fantastic review, Carrie! I’m so glad you enjoyed this one too! Original and so enjoyable! I haven’t, but I am taking note of Her Last Secret! Thanks, Carrie! I have never read anything from this author, but I am planning to read this one. Great review Carrie. It is nice that there are some surprises and originality with this story.